Plotted – You can see the sked in calendar type. Aug20_Aug24_CamVie – Detailed itinerary of Cambodia & Vietnam with the accommodation, transpo details and directions. It’s basically our manual. Aug25_Aug28_Lao – Detailed itinerary of Laos (same template of #2). Aug29_Sep01_Tha – Detailed itinerary of Thailand (same template of #2). Transpo – Plotted are the legs of our transpo and the amount per leg. Accommodation – All accommodation details are here. What’s the best part of travel for me? EVERYTHING. I love the planning and the execution but unlike before, I don’t obsess in following through everything. I have become flexible especially when it comes to travelling with the husband. I’m the researcher and the husband is the explorer. I have always wanted to travel alone but God wants me to do it with the husband instead. I couldn’t be more thankful because I’m SUPER BAD with directions. So what makes us decide to travel to IndoChina? This is the “Plotted” sheet. 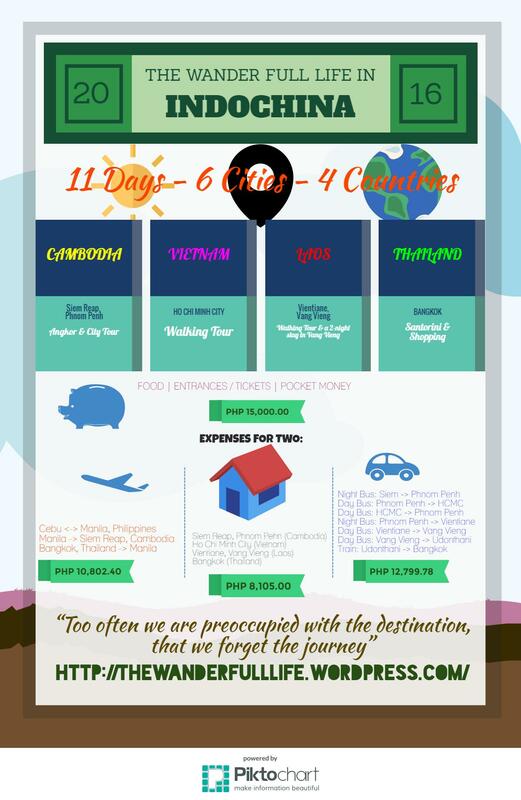 Previous 14 Days To Go Before The Wander Full Life in IndoChina! Great planning! It’s gonna be an awesome trip! Pingback: Birthday Flashback 2 | Just Kring! Happy trip, stay safe, and enjoy! Can’t wait to read more about this adventure!